I'm not sure if I'm a couple of days early or very late with the Let's Brew Wedenesday. Let's be positive. A couple of days early. We've another Mackeson recipe for you. This time from the beer's glory years, just after WW II. 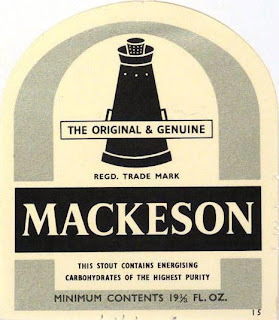 A few years after this beer was brewed, Mackeson was accounting for a round half of all Whitbread's production. They brewed at just about all of the breweries under their control. In 1959 that included: Chiswell Street (where the beer below was brewed), Stockport, Kirkstall and Hythe. General info: Mackesons Sweet stout 16 years on from the last one. Not a ton has really changed with the percentages in the grist. About the same about of lactose added back in the primings. About the same amounts of sugars. Where you really see the biggest difference is in the size of the beer. We've dropped nearly 9 gravity points and about 1% in alcohol. The color comes down a good ways also. The hopping levels stay pretty much the same so the BU of this beer goes up a bit. A very neat side-by-side comparison of what was Mackeson stout. Tasting Notes: Very very much similar to the 1936 version just toned down a bit more. The 'lighter' product makes it even smoother and more drinkable. Yes, kinda lame to do two of the same recipes nearly back to back. However, even with near identical grist, the drop in gravity and percents across the board make this unto its own. I think its even better than the ’36 version. The mention of my hometown Stockport caught my eye and left me wondering where Mackeson's was brewed. Stockport CAMRA's pub guide provides the answer. "The Royal Oak Brewery still stands on Higher Hillgate and is being converted into residential use...taken over by Manchester Brewery Company in 1923...then mothballed until WW2 when first the Cornbrook brewery and then, from 1943, Whitbread brewed there. 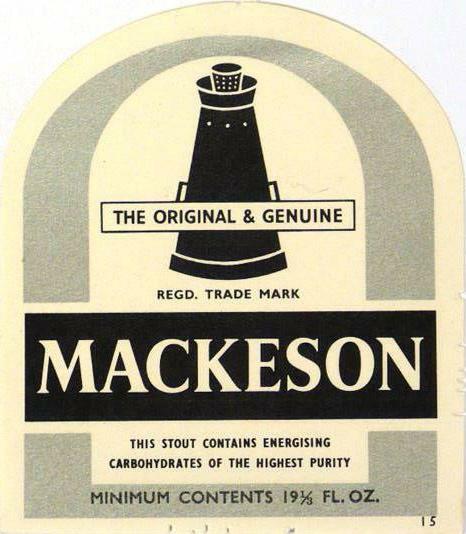 There are records of Mackeson milk stout being brewed...until 1959." I JUST PURCHASED YOUR PORTER AND STOUT ,LAST TWO BOTTLES ON THE SHELF, ARE THE RECIPES ON YOUR BLOG? Anonymous, not that I can remember. But after more than a thousand posts, I could just have forgotten. The percentages of the recipe does not tally up! Anonymous, that's true. Not sure what went wrong with that table. Though if you copy it, you'll see there's an invisible second lactose entry of 7.9%. If you include that, the total is 100%.